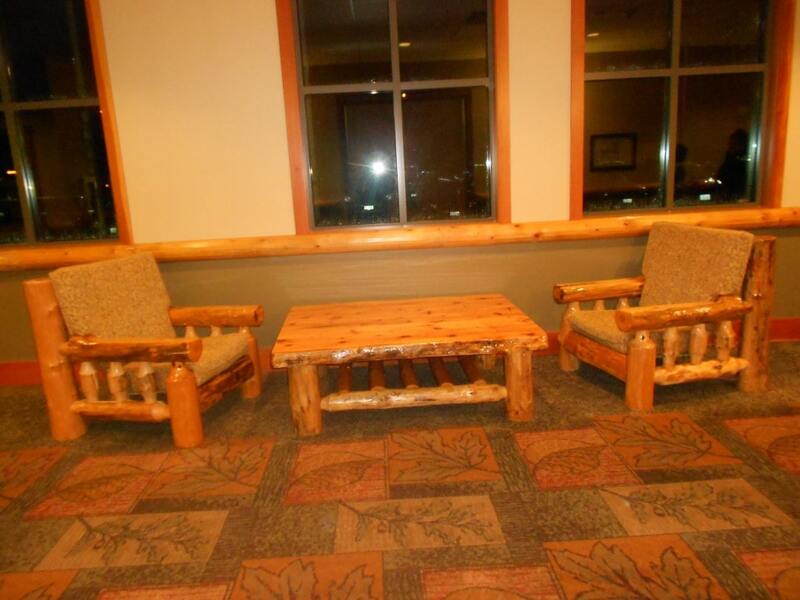 We recently grabbed a night at the Great Wolf Lodge, when it went on sale on one of the deal sites. We got a great room rate, so now the challenge was to see how we could enjoy our stay without going broke while we were there. 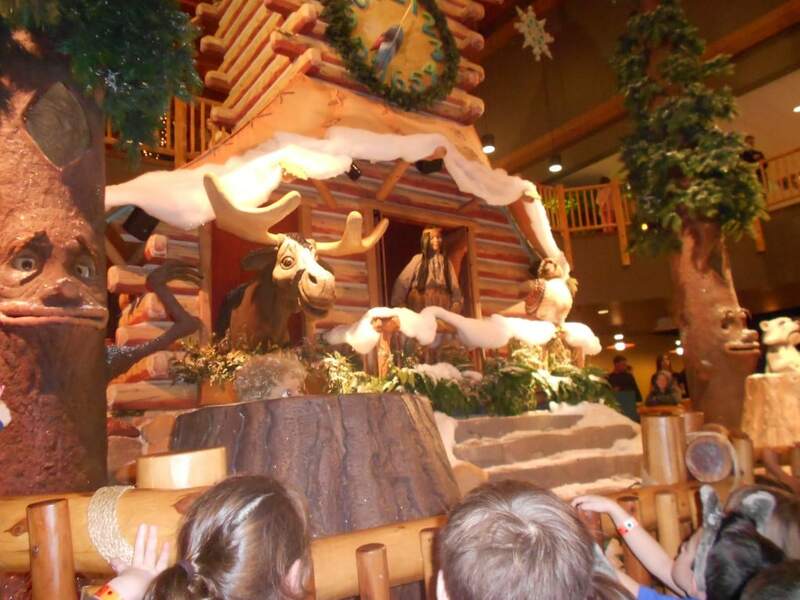 Great Wolf Lodge can be a very expensive getaway (even for just a one night stay), but with some careful planning you can save quite a bit. You could go for the price of the room and gas, if you brought your own food from home, and kept the entertainment to the free options (like the waterpark, and clock tower story time, etc). If you prefer to do all the extra things the lodge has to offer too, then we have some tips on how you can save money on those options as well. 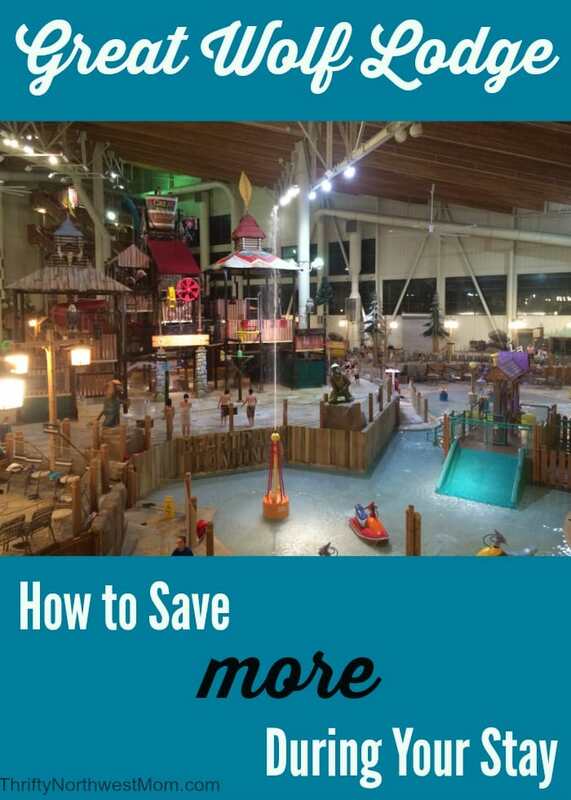 Here are some money saving tips for the Great Wolf Lodge in Grand Mound, Wa., that we picked up while staying there. You can also check this post to see if there are current Great Wolf Lodge promo codes available to help save on your stay! In addition to the promo code deals post we mention above, be sure to check out our post with tips on saving on your room here. Be sure to provide your email address and cell phone number (and allow them to text you promotions) when you check in. I provided my email and got coupons sent to me ahead of time. I have heard of other folks getting coupons texted to them ahead of time as well! Upgrade Options. Once you have booked (be sure to provide your email address at booking), and keep an eye out for your Welcome Email (mine was titled “Looking Forward to your Stay”)! Depending on the time of your stay (and how booked the hotel is) you should be offered some options to select optional upgrades. You can book a more affordable room, and see if you get the option to upgrade to a nicer suite as a way to save on your room options. This is not a guaranteed option (its a possible way to get an upgrade) so don’t use it if you need the bigger room – its only a good way to save if you do not mind staying in the smaller room if the upgrade option does not work out for you. Some examples of upgrade options we were sent include: + $14 to stay on waterpark level, +$44 to upgrade to the bigger suite (Bear Suite). Get a FREE Photobook! When you get to your room, look for the shutterfly photobook display. Ours was on our fireplace mantle, but it will depend on the size of your room. Inside the display book, you should see an insert with a promo code on the back that will give you a free photobook from Shutterfly. They did not advertise this freebie to us, so be sure and ask about it if you do not find one in your room! You should get FREE wolf ears at check in for each person in your party. These are a great way to save on momentos – give your kids these when they ask for something from one of the stores! Not so much a money saving tip – but the elevators can get crowded. They have elevators and stair wells on the far side of each hotel hallway too that are much less crowded. We liked to use those, and then walk the hallway on the floor we were getting off on (usually 1 or 2) and avoid the longer elevator wait times. Consider booking a bigger room with another family, if there is someone you are comfortable with, if you are a smaller family. For example, the room we booked through a recent special was $200 and slept 7. A family of 3 and one of 4 could book this room together, and you would each only have to pay $100 plus taxes per night. That is less then what it would cost for you to each book the smaller room individually (this is just an example based on the rates we booked, but it will almost always be cheaper for two families to split a rooms cost vs. getting one by yourself). You can easily get away with only booking one night at the lodge, if you want to keep your costs down. That is because you can check in at 1 pm, and get access to all the resort has to offer that day, as well as the full day of fun on checkout day (until 9pm). If you check in before 4 pm, they do not guarantee that your room will be ready, but they do give you a bracelet which allows you to access the waterpark and the rest of the resort, then they call you as soon as your room is available (and will store your luggage for you). Once they call you, you simply head to your room – you don’t have to go back to the front desk or anything else. On checkout day, you will have to be out of your room by 11 am, but your bracelets will allow you access to all resort amenities until 9 pm that night. We were offered a late checkout option for $49 after we booked (late checkout is 2 pm) if you want to have access to your room later in the day. We find its just as easy to get out of the room by 11 am though, and save that $49! What works best for us is to be packed up and ready to check out at 11 (its express checkout so you do not have to do anything but be out of the room by that time). We then stored our bags in the car, and kept a day bag with us to store in a locker, and that was the most affordable way we found to enjoy two days of play for one nights stay price. If you really do not like to stay at a hotel without access to your own room/space, you can consider booking a cabana for the day of checkout. It was sent to us as an upgrade option for $149. That is not cheap. but it is most likely cheaper then buying 2 nights of rooms. The cabanas offer privacy, seating, a TV, Safe and beverages. One word of caution. The bracelets that act as room keys, also have your credit card info on them in case you want to charge to the room. They did not tell us this at checkin, and I got one for both teens with us, with no instruction to the kids on what they could or could not charge. Fortunately for me, they did not charge anything. Also, one kiddos bracelet broke off of him. Fortunately he is a sharp kid, and kept the bracelet with him – but I would have instructed the kids to be really careful if I knew that anyone with the bracelets could charge to our room! You will want to cut the bracelet in half length wise when you are done to protect your credit card info. 1) You can bring your own food. This will be the cheapest way to go! The rooms do have mini fridges and microwaves as well as a table to eat at if you choose. I talked to some families who like to bring a crock pot with them and cook an easy meal that way. There is also a small (2 cup) coffee pot in the room. If you like to have a glass of wine or beer at night, you should bring your own wine (a bottle at the resort will cost you around $25). Even if you like to eat out, I do recommend that you consider bringing your own beverages. With the waterpark and all of the other fun, the kids can get thirsty and a bottle of water or soda will cost you $2.50 at Great Wolf Lodge. They did have a refillable mug for $12.50 for the day, but still not a great deal. It would cost us $10 just for 4 of us to grab a bottle of water, and that was just for 1 bottle each. 2) Get one of their family pizzas. During our stay, a large pizza was as low as $14.49 (depending on what you want on it). There are also side salads that start at $7.99 ($12.99 for a full size), but still a much better price then the $70 it cost us the night before. They also offer family sizes of spaghetti for around the same price, so its a good way to stretch your dollars. Bring your own 2 liter or bottle of wine and enjoy your pizza in the lobby by the fire and you have a great meal for around $25 (a 2 liter of soda will cost you almost $5 in the restaurant)! The lobby was a zoo while we were there, but if you walk down the hallway towards the conference area – we found lots of open seating for my family -see photos above (or you could take the pizza back to your room). The pizza spot is right up by the entrance to the waterpark. I will say that their pizza has really improved. We had it a few years back, and it was so much better this year! 3) Our FAVORITE place to eat at Great Wolf Lodge in Ground Mound, is the Burger Claim (check out their menu ahead of time, to plan your budget). It is a restaurant in the parking lot of the lodge, but separate from the lodge. If you walk through the conference area of the lodge, you can go out the side door of the building and it is just a short walk outside. Their prices were very affordable and food was all cooked there (burgers never frozen, hand dipped shakes, fries cut up there – you can get sweet potato or regular fries, etc.). It’s mostly a burger menu, but good food and affordable prices. They do offer salads and great breakfast prices too though. The food here is comparable to a Red Robin type restaurant, but we really like it. You can be frugal when you order to keep the prices down too (ie share a basket of fries between 2 or 3 of you, versus everyone ordering their own. You can also show them your Great Wolf Lodge bracelet for 5% off your bill! We paid around $40 here, but that included shakes for the teens, and ice cream sundaes for the kids, in addition to their meals. There was a coupon for a free ice cream with kids meals in the coupon booklet (and breakfast was cheaper then what Dennys cost us on the way out). Pancakes are just $1.99, burgers for $5.29 and there are family meal options you can get for around $20 – so its a great dining out option that will cost you less. Its also a great spot to get your ice cream treats if the kids are asking for those. An ice cream sundae here will cost quite a bit less then it will at GWL. 4) Convenience Store in Parking Lot. There is also a store right next to Burger Claim, with your typical convenience store prices, if you are in need of drinks or snacks. They are not cheap, but will cost you less then GWL on many items. For example, we forgot to stop and get drinks before this trip. A bottle of wine here cost us between $10 and $15 vs the $25 at the lodge. 4) There is a Starbucks on site, but it has the typical tourist location prices. You can use the coffee pot in your room, or head to the convenience store for your coffee, but this is the most convenient spot for a latte around. 5) Book one of the food packages ahead of time. These are not a way to get super savings, but if you plan to eat at the restaurants in the Lodge, they will save you over retail. Once you have booked, they send you some package options to book for your stay via email. Our package options included breakfast for $10 per person, including gratuity (this should save you around $6 -$7 per adult, as the package includes beverage and gratuity). The price they offer you will depend on the size of your party (we had 4 – so I think it may get cheaper if you have more people). The waterpark is free with your stay, but as much as we enjoyed it we did not want to spend all of our time there. Here are some other great ways to keep the kids happy. Coupons for Great Wolf Lodge. When we booked our recent stay GWL sent us this page of coupons good to use at the Ground Mound Great Wolf Lodge location! If you provide them your email, they generally follow up the confirmation email with a welcome email that has a link to current coupons at the bottom of it – so be sure to share your email address when reserving your room! Our coupons where good for various entertainment/shopping options. The Cub Club for little ones. This is a roaming club, but we seem to always find them in the back corner of the main lobby area. This was a great place to go hang out with toddler and preschool age kids. There are many activities you can do for free there. 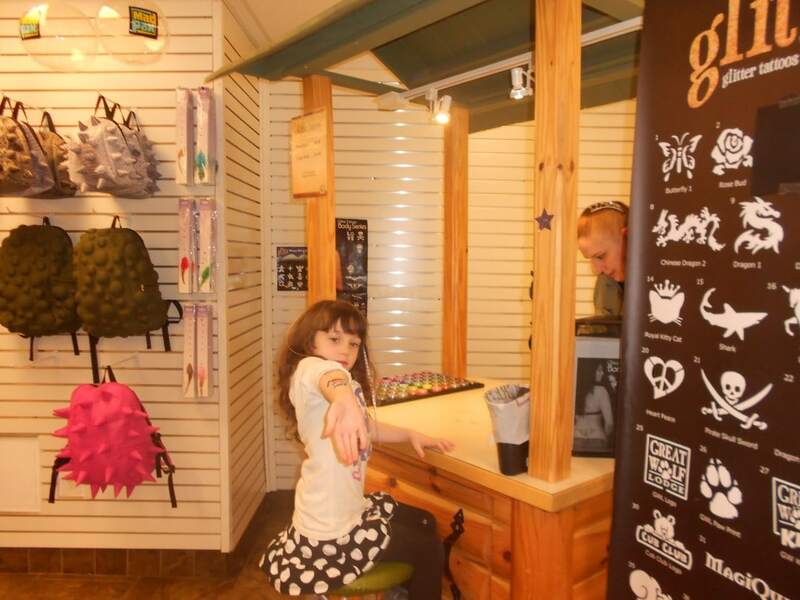 We loved the arts and crafts table, there were stickers, foam pieces scissors, glue, tattoos and more for the kids to design with for free. This last visit they made free balloon animals for the kids, so look for them in the lobby. Board games at the front desk. These were fun to use hanging out in the lobby with a pizza, or take back to your room. Free and a nice way to unwind with your family. Check out the tables out by the conference part of the hotel, to get away from the heavy crowds and noise of the lobby, if you do not want to go back to your room yet. Book around the events schedule seasonally at the hotel. We were there during the Halloween celebration one year, so the kids got to dress up and do a free trick or treat trail (bring your own costume; they sell them but they are expensive). They also had other activities like a kids disco time that was free (the dance parties are generally held on Friday and Saturday nights – which are often more expensive nights to book, but you will want to consider the extra free entertainment options on the weekend too). 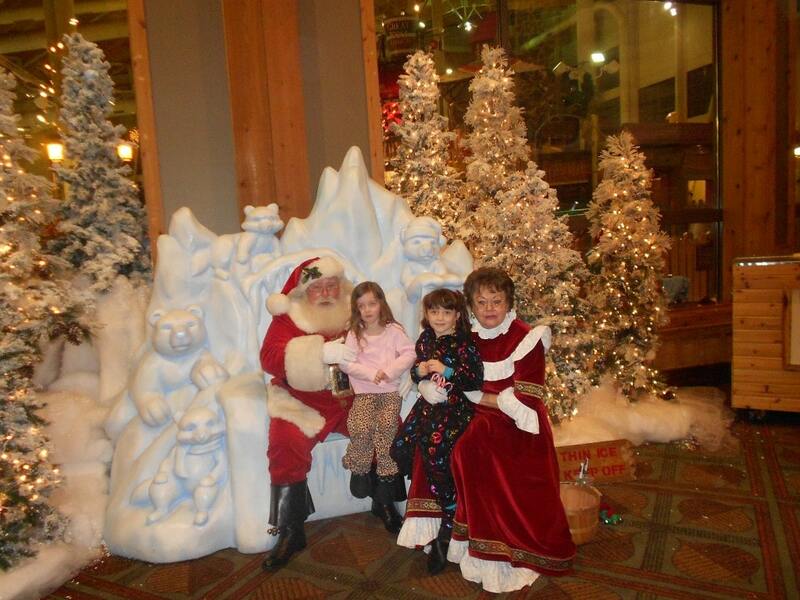 We have also visited during the Christmas season, so the kids were able to get photos with Santa, and enjoy an evening snow show in the Lobby, etc. This year we went in November, prior to the holiday stuff, so there were no extra entertainment options, but smaller crowds. They also have Story Time in the Lobby at 8pm and 9pm. The kids can come in PJs, but be forewarned – this can get crowded and kids (and parents) pushy. You can go down in the morning for a wolf walk too. They will provide you a schedule of the free activities during your stay when you check in. The Kids Spa is really pricey – but you can walk across the hall to the kids store next to the bakery, and get a glitter tattoo for $6 (my birthday girl got one, and we had to scrub it off a week later in the bath – they stay on well, but they do recommend you do this after you are done with the waterpark). Note – these are the package options we received for our trip, yours may be different. 6) Book a Package. If you plan to do more then one activity, consider booking them as a package. You will save over the retail cost of each activity, if you book them as a bundle. They should send you your current bundle options after you book in the welcome email we have referred to above. The picture above are some of the options we were sent when we booked. 7) Glow In the Dark Putt Putt Golf. This game was $6 per person, and it was a small course, but we found it to be one of the most affordable family activities that had a fee associated with it. The course is not huge, but if its not crowded you can ask at the desk if you can skip the last hole to play a second round (ask before you head over, as the course is across from where you get the clubs). It seemed to be one of the less crowded activities while we were there. We love GWL. My son and I are gluten free and this is one of our favorite family trips since we have a fridge and micro in the room and we don’t have to worry about carriying around our safe food. Burger Claim also has GF buns AND fries. The food was tasty and a pretty decent price. We did a bday trip and got the kids badge deal which included lots of activities and toys— for a special trip, it was totally worth it. The wrist band actually has to be registered by you in order for things to be charged to it. It’s not an automatic thing. We also found the breakfast buffet to be a great deal for our family. I don’t recall the price but there was a ton to choose from. We’d fuel up, have a light sandwich (from home) for lunch and do the pizza thing for dinner. We just went to the GWL in Williamsburg, VA a little over a month ago. When we checked in they asked if we wanted to be able to charge things to our bill with our bracelets and I said no, so you should be able to forego that option if you choose. At the on-site restaurant (The Loose Moose Bar & Grill) you actually got a free kids meal with every adult meal purchased (and we just got the soup and salad bar, yum! ), so it turned out to be a really good deal. We also got a pizza on our last day and it wasn’t really overpriced and it was excellent. Also, we held out on buying the kids the big twirly cups until the last day, then realized we would have saved a lot buying them the first day and refilling. Refills were cheaper than buying a cup and tossing it every time. My family of 8 just went to Great Wolf Grand Mound a couple weeks ago. This was our second trip. Both times we brought along our crockpot and as soon as we were able to check into our room I plugged it in and put in our meal, this time it was sweet and sour meatballs and rice. We were able to check in about 3:30pm and our meal was ready at 6:30pm. We also brought along microwave popcorn, trail mix, and our own sodas and juice. For breakfast we had brought bagels and cream cheese, muffins, and fruit. My little ones participated in the story time at night and the Wolf Walk in the morning, as well as a promotion they were having to fill out a card by doing these activities and a couple others to receive a free certificate, 8 game room tokens, and a small toy! When we left we ate dinner at the Figaro’s pizza close to the lodge for a reasonable price and I noticed that they deliver to the lodge, too. 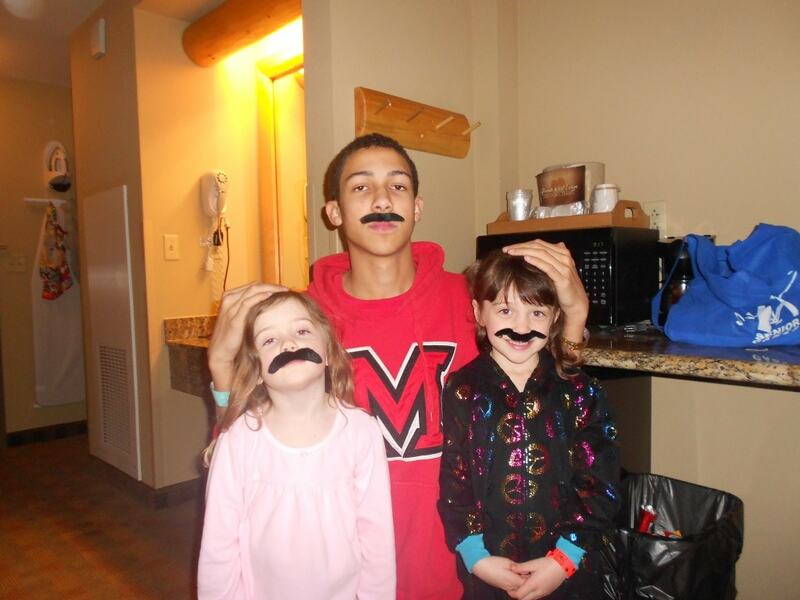 We really enjoy Great Wolf and it is a great family activity! 21.99 and the game the first time but the wand you can bring back each visit. $12.99 for the game then. I know some families that just share one wand. The kids get a lot of exercise and it makes them think. My daughter loves this more than the water sometimes!